Product is available as both an on-premise and SaaS solution. Vendor works with companies of all sizes in all industries. Prophet 21 was designed for distribution companies of all sizes in the fastener, fluid power, HVAC, industrial, jan/san, medical equipment/supplies, paper/packaging, petroleum, pharmaceutical/chemical, and tile industries. 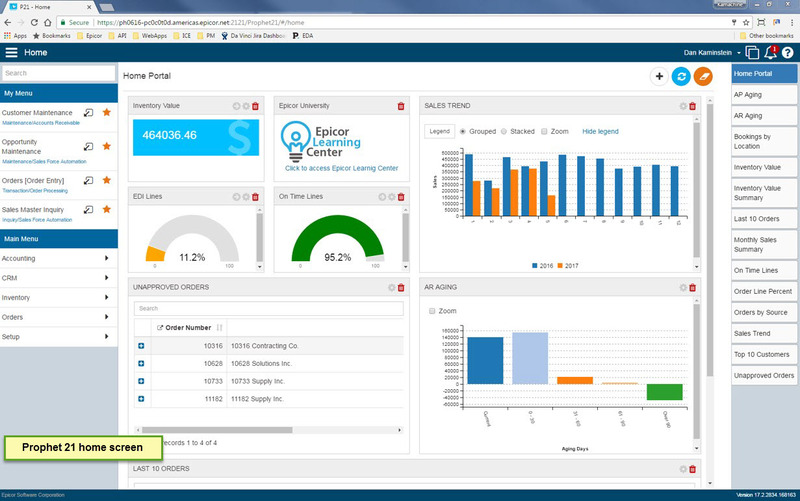 Epicor® Prophet 21® is a complete end-to-end business management solution, designed for today’s distributor in a single application with capabilities such as: mobility, eCommerce, analytics/business intelligence, financial management, CRM, order management, pricing, purchasing, warehouse management, service/maintenance management. Prophet 21 is best suited for distributors in fastener, fluid power, HVAC, industrial, jan/san, medical equipment/supplies, paper/packaging, petroleum, pharmaceutical/chemical, and tile industries. The latest release of Prophet 21 combines proven Prophet 21 distribution expertise with a new end-to-end Web-enabled infrastructure and modern technology stack: HTML5, Angular JS, .NET, and SQL Server®. It runs on any browser, improving usability and mobility while allowing distributors access from any device, anywhere. It’s built on industry leading, proven SaaS technologies for lower total cost of ownership (TCO) and continuous improvement On-premise and cloud deployment options are available. Distributors can start with the on-premises version and migrate to the cloud as their business grows. Epicor Software Corporation makes it easy for distributors to leverage solutions that fit their industry for digital transformation and growth. With nearly 50 years of experience with each customers’ unique business processes and operational requirements, Epicor offers the only true solution built for Distributors – with more out-of-the-box functionality to match each unique business than any other ERP provider. Enterprise Software for Distributors - Is There a Perfect Fit? No other ERP provider knows distribution like we do. Epicor is focused on the things that matter to you—work queues, PO variance queues, kitting, assembly and production orders, advanced inventory forecasting, VMI, and special project pricing. We build our software using industry best practices and over 45 years of distribution experience. Established in 1985, Emergent Safety Supply is a distributor of janitorial and safety products—ranging from earplugs and gloves to high-end equipment for confined space and fall protection. Emergent Safety Supply has developed a reputation as an innovator of safety solutions, bringing new products and services to its marketplace.